What is SimmBook and how does it work? You can free download the software from https://simmlicences.com/download/simmbook_installer_64bits . All SimmLine products have a trial version for 15 days, without any restriction. 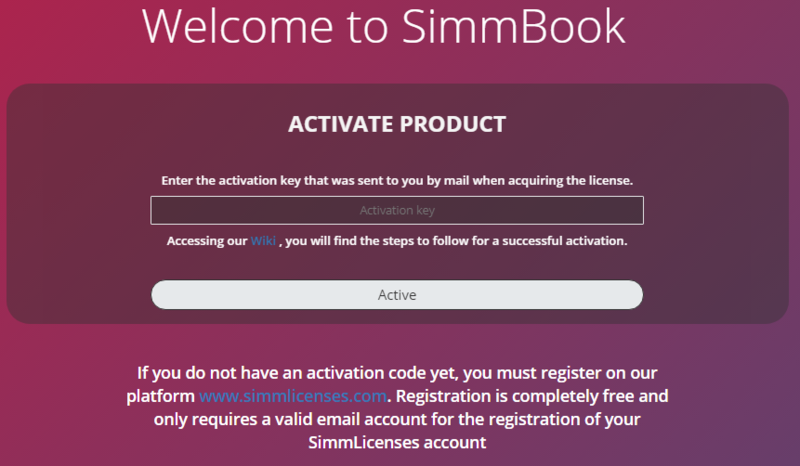 To activate a trial for 15 days or acquire a SimmBook license, it is necessary to register on our website www.simmlicenses.com, the registration is completely free and only requires a valid email account for the registration of your SimmLicense account. 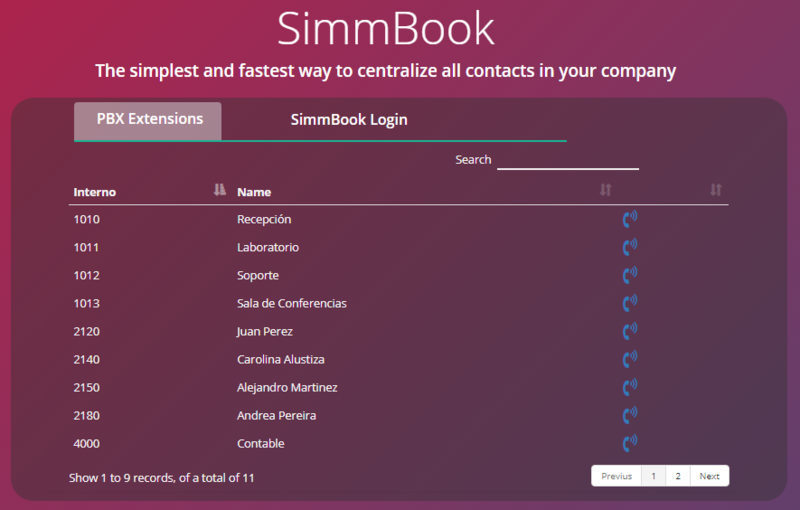 SimmBook consists of two sections, a tab shows the extensions that are registered in the PBX and offers the possibility of calling the extension by clicking on the button . 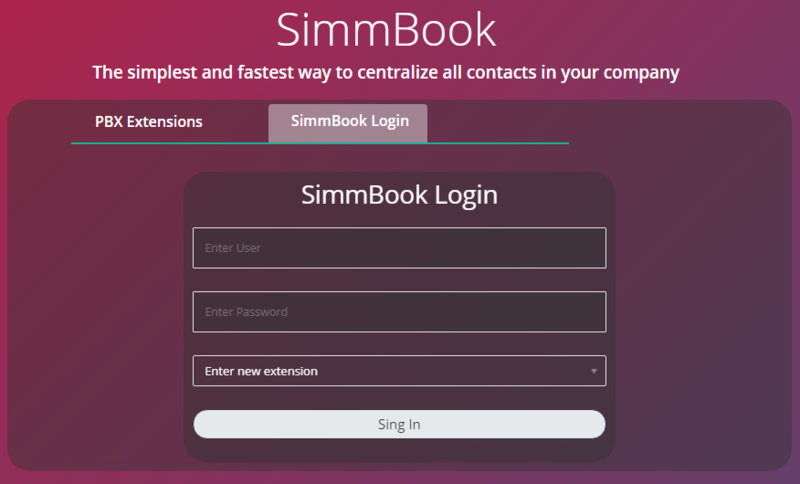 The second tab “SimmBook Login”, allows users to log in to SimmBook to see the contacts, lists and other functionalities of the application. Users can see on the left of the screen the options menu of the platform, and in the center of the screen 4 tabs that allow to consult: all contacts that the user created, the contacts marked as favorites, the extensions of the PBX and the contacts grouped by lists. The lists that are displayed in the “Contacts by List” tab, are the Private Lists that the user defined, and the lists defined as Public by the other SimmBook users. From the main panel, users have a Search field that allows them to filter any string or number, they can initiate a call with just a click on the button located to the right of the telephone number and consult the personal data of the contact through the button . From the general parameters, users will be able to establish the general data of the company and define which prefix will be suggested when creating a contact. Prefix, define which outbounds route must take asterisk to make the call to the contact number. This value is displayed when creating a new contact and can be modified. Asterisk data, by default when SimmBook is installed an AMI user is created with the values shown in the fields, Host, User and Password. If you want to change the user of the Asterisk administrator interface, the password must be modified first and then follow the steps HERE for the creation of an Asterisk Manager Interface user. It is a group of permissions that determines what access and actions each user can make within SimmBook. Each user can belong to a group and each group can be shared by several users. By default SimmBook have created an Administrator User Profile that can not be deleted and that has access to all platform functionalities. This section allows you to create, modify and delete contacts, lists, categories and blacklist. For a better experience when configuring the platform, it is recommended to create the Contact Lists, the Categories and then the Contacts. Contacts lists allow grouping contacts for better identification and to share them with other users of the application. The lists can be Private or Public. Private: private lists and the contacts that comprise it can only be viewed by the user who created them (owner). Public: public lists and the contacts that comprise it can be viewed by all users of the system, from the Contacts tab by List of the main panel. The use is direct. You can click on the + Create List button to insert new records or click on the action buttons of each record to edit them, delete them or assign contacts to the list in bulk. There is a search box that allows you to search for any string or number. 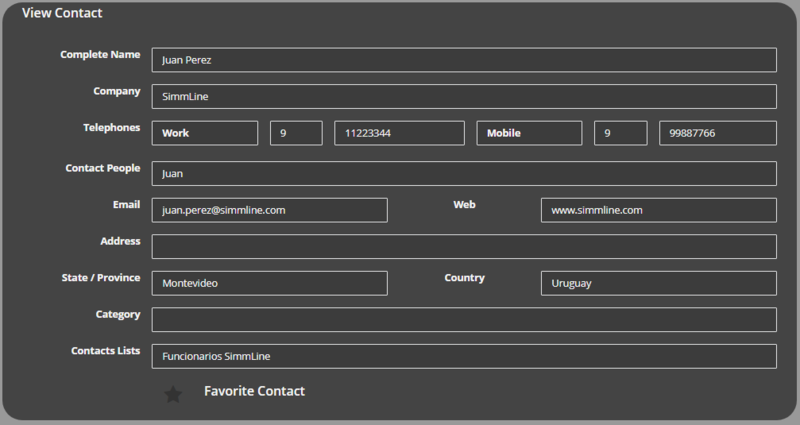 1- At the moment of create a new contacts, the system will allow us to indicate in which list it belongs. 2- The other option is through the button located within the available actions of each list. The difference with the first alternative is that from here you can add or remove Contacts in bulk. Through the selection we will indicate that we want to add the contact to the list. The categories of Contacts are together with the Lists another form of grouping, their use is thought to complement the lists, but it can also be used independently. Suppose you create a list of Officials that contains all the employees of the company, and in turn you want to group the contacts by department, by creating the departments as categories, we would have a filter that is the list of Officials and another by department / category. The use is direct. You can click on the + Create Category button to insert new records or click on the action buttons of each record to edit them, delete them or assign contacts to the list in bulk. There is a search box that allows you to search for any string or number. In SimmBook a contact is any person or company for which you wish to have a record of personal or contact information. The use is direct. You can click on the + Create Contact button to insert new records or click on the action buttons in each record to edit or delete them. There is a search box that allows you to search for any string or number. The contacts are private and can only be modified, deleted or consulted by the user who created it. The only case in which a contact is visible to other SimmBook users is when it is linked to a Public Contacts List. Most of the fields are self explanatory, such as name, address, etc. In the case of the Prefix, define which outgoing route must take asterisk to make the call to the contact number. The hidden contacts works the same as a blacklist, the telephone numbers entered in this field will not be displayed anywhere in the system. The use is direct. You can click on the + Create Hidden Contact button to insert new records or click on the action buttons in each record to edit or delete them. There is a search box that allows you to search for any string or number. Within the tools menu we have two options: Contacts Import and Yealink Remote Phonebook. From an external file in format .Txt or .Csv. the tool allows you to create a contact or modify it if there is a record with the same name or the same company name. If any of the fields you do not want to complete must be left empty but respecting that all records have 8 defined values. This tool generates the necessary URL so that the Yealink phones with Remote Agenda support, automatically import the contacts in the phone. To know if your model has such capacity and how to configure the remote calendar, consult the information on the manufacturer’s page.